For a decade Isamu and Otonashi have been the only 10 pointers in the game. Bol seeks to join them in the lowest-point-figure club, but is he deserving of the position? Bol’s best comparisons for balance are, naturally, the other 10-pointers. He doesn’t have the end game winning potential that Isamu has, but I would be wary if he did. He compares best with Otonashi, as she and Bol have the same stats, can both add 2 to their attack and have a power to help them get bonus moves into position. The two also have niche roles that help define the kind of army that will look to utilize them. It is also worth mentioning that Bol can be activated by a Nottingham Brigand’s Rogue Hero Bonding. This gives him some versatility and should be considered in his point value, but his stats in general are weak enough that he isn’t better than an additional Brigand in the army. Overall, his price as a 10 pointer is balanced well. The overall theme of Bol is his role as the Goblin-gone-good sidekick. His powers accurately reflect that role, playing out as a character who, even with his change in Valkyrie general, is still not afraid of taking advantage of opportunities and fighting dirty with Ankle Shank (or “Shankle,” as I call it). These powers/theme further play into his class as a Rogue, waiting for his opportunity to strike. 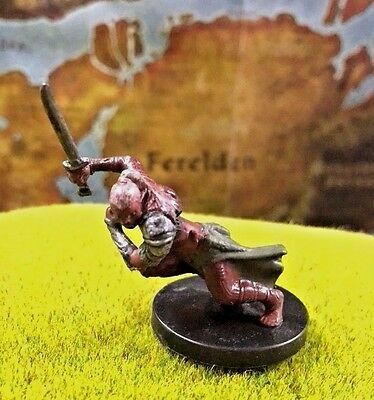 He is visually distinct from the other Heroscape Goblins, which helps set him apart on the field, and helps paint him as an outcast from the rest of the Goblins. Bol brings two new powers to the table with Opportunism and Ankle Shank. Opportunism is a fun and unique power that allows Bol to take a turn when one of your heroes meets an untimely end. Ankle Shank is a more simple power to give him extra attack against large/huge figures, and is a neat callback to the other 10-point figures who also have the ability to roll 2 more dice against certain figures. Scale and Disengage are both powers used more for their utility, and play into Bol’s use. The combination of new and old powers makes for a card that feels fresh but still in line with Classic ‘Scape. Bol’s card is great, but what happens when the paper meets the board? Like any 10-pointer (or any filler, for that matter), he’s not meant to have an army built around him. If you think you can run straight Unique Heroes with Bol to bail you out, you’ll be wrong. His stats are weak enough that taking a turn with him doesn’t really compensate for a missed turn with a stronger hero, and you’ll still benefit more with good Order Marker management than on relying on Opportunism. Even in the end game where you may lose a hero in an initiative gamble, his use doesn’t completely make up for the turn. I feel that’s a feature of the design, not a bug, as he’s just a lone 10-point Goblin and shouldn’t be expected to do much. I did find Bol to have some extra utility in dungeon crawl scenarios, where you’re more likely to run Unique Hero armies and where a bad roll against a dungeon baddie can ruin your day. It allows you to run Bol in for an extra hit or sneak him around to distract other enemy figures. The higher amount of Large/Huge monsters in dungeons also adds to his value there. He still won’t save your bacon in an average game, but if he can put in that final wound on a Hydra just once, you’ll be glad to have him along. I also liked using Bol as a tech option in a Brigand/Rogue army (assuming I had 10 points left). While often the worst figure to bond with in that army (again, as expected of a 10-pointer), he can be used for a distraction/quick strike against an opponents Large/Huge figure. There are also times where you will lose your Brigands quickly and rely on their Rogue heroes. In that kind of endgame, Bol’s Opportunism can come into play if one of your heroes meets an untimely demise. Bol brings a fun power set to the game. He creates his own niche and fills it well, and while he often won’t be the key factor in winning a game, that’s to be expected of a 10-pointer. In all, he adds something new while feeling like a unit that would fit in the original game, and provides a good third option for 10-point heroes when creating an army. I vote Yea to induct Bol into the Soldiers of Valhalla. Kha has passed United Fanscape Review and moves forward in the process. I know this is super late, but I just noticed this. Would have been neat if he was a Lizardfolk to bond with the Greenscales. However, he is listed as Serpentfolk as a species originally. In the second image in the submission post, it's obvious he's not a lizardfolk. Otherwise that might have been a cool direction. Nice to see you around these parts, Mega! Yeah, it'd be nice to see more Lizardfolk heroes, but I have to say, there's something really cool about having a snake-man that makes up for that minor dissapointment. I have the mini - you could make a lizardfolk argument, but yeah, I prefer a serpentfolk dude. Balance wise Tez is fine, her powers and stats don't seem out of line with what you can get at that point cost. There is a fair bit of competition at the 30-40 point level though, and she doesn't really have much to make her stand out save her ability to overtake glyph positions. Thematically the design is ok I suppose. It's an angry jumpy fox person or something, huzzah. Still, fantasy gaming is full of not especially interesting but mildly weird things like that, so I won't hold it against Tez. My only real beef is with the name 'Strategic Repositioning' for the first power, besides not really being a strategic level power, the name doesn't really seem to jell with the whole 'fearless charge rah rah!' thing the rest of the design (and even the rest of the power) has going on. First Assault is a fitting reuse and Strategic Repositioning is and interesting new power even if I don't care for the name. No complaints here. Tez feels like a figure in search of an army to me. The problem is, there's another Scout and another Hybrid at nearly the exact same cost as her. For anything specific to Scouts, I'd usually rather have Theracus and anything specific to Hybrids I'd rather usually have Seleena. If I'm just looking for general filler, there's even more competition. Tez does have a few unique points in her favor however. For one, she can move up the Teeth of the Makwa during a Werewolf Lord granted turn if you feel like rocking some crazy Hybrids and Scouts army. More viable however, is her ability to overrun a position. Both of her powers and her high move all converge to make this her raison d'être. While not always doable, on the right map she can steal a glyph right out from the other team's noses, and that definitely has value. It was close, but I feel Tez is both harmless enough and unique enough to earn a spot in the ranks even if the card doesn't appeal to me personally. I vote to induct Maltis Tez to the SoV. Maltis Tez by @Leaf_It has received 4 Yea votes to induct (Scytale, superfrog, BiggaBullfrog, and Soundwarp SG-1) and moves forward in the process. Last edited by Scytale; June 14th, 2018 at 11:47 AM.